Aruba, the “A” of the ABC islands in the Caribbean. Despite being only 15 miles from Venezuela, it’s actually an autonomous sibling of the Netherlands, and you’ll notice this Dutch influence everywhere, right down to the style of road signs on the street. The southwest part of the island, near the airport and capital city Oranjestad, is where you’ll find those glistening white beaches. It’s also where the majority of the resorts are. But I’d like to suggest a few ideas for exploring the rest of Aruba. Overlooking the fact that our 4×4 filled with four smiling holidaymakers nearly tipped over as we took a cliff a little too valiantly, off-roading around Aruba is one of my favourite travel experiences. It is very safe and a popular tourist option because it affords you the flexibility to see sights otherwise not accessible. One such place that is a must-see is the natural pool, or the “conchi.” It’s this swimming pool made by mother nature – very tranquil and peaceful despite being right on the ocean. If you hire an ATV you’ll likely take a organised tour, which takes some of the stress out of finding your way where there are no signs, but just be careful on those steep slopes! Another popular stop for 4×4 drivers is the natural land bridge. This was once one of the largest land bridges (a natural bridge made from eroding water) in the world, but sadly it has collapsed. It is still worth visiting, though. If you want to relax and do nothing yet getting tired of your beach view, why not catch a boat? Despite the close ties with its neighbours, there are no ferries on or off Aruba, except to a tiny snorkelling island a few miles away. But you can circle the island and enjoy several styles of cruises. For those who want to snorkel but keep their hair dry, you can take a glass bottom boat tour, highlight just how much beautiful coral there is around the island – and hopefully you’ll be impressed by all the colours of fish like I was. There’s a dinner cruise option too, though make sure your cruise takes advantage of the “green flash” – this is a natural phenomenon where the sky turns green just for an instant as the sun sets into the ocean. It’s true! Custom states that you should enjoy this moment with a glass of champagne, which seem perfectly reasonable. You don’t have to look hard to find Arikok National Park – nearly a quarter of the island is designated as this special preserve. The park was setup in 1997 to help protect the indigenous flora and fauna of the island from the rapid growth of tourism. 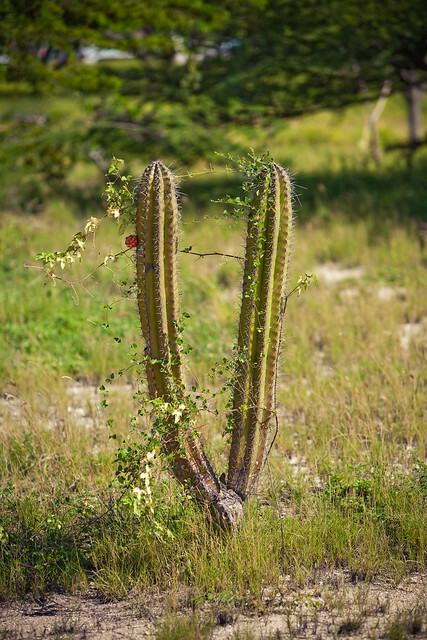 Those who never leave their luxury waterfronts probably won’t appreciate that Aruba is a very arid desert climate, and the island originally had more cacti than palm trees. You could easily spend a day or two exploring the various sites that can be found in Arikok – both natural and manmade. Look for some of the hidden grottos and caves, and of course the natural beaches. There are a few hills that offer some fantastic ocean views. But there are also a few man-made attractions too; top of my list are the Caqueito Indian rock paintings. The park organisation has also restored a few adobe homes that you can go in and see. 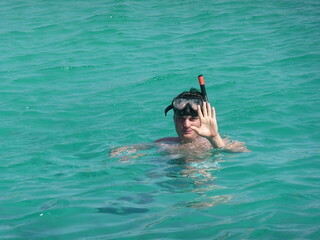 Last but not least is Aruba’s well known attraction, but you will not see it unless you look, because it’s underwater! You can get a taste of the fish and coral that surround the island on the glass bottomed boats I mentioned earlier, but the best way to really check out the watery scenery is to do some snorkelling. Options abound for places that water for this, but the best places are in the area around Arashi Beach, Boca Catalina and Malmok Beach. 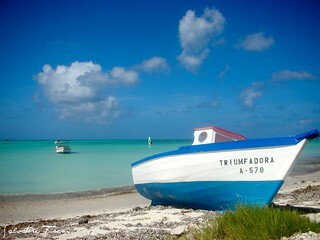 Many of the tour operators head for here, so it isn’t quiet and idyllic (though not many beaches in Aruba are). Just off the shore of Malmok is the wreck of Antilla, also known as the ghost ship – though you’ll need a boat to tour this. Also ask about options to visit Pedernalis, a German oil tanker sunk in WWII. Both are covered with beautiful coral formations and you’ll share the water with hundreds of fish. Seeing a school of fish swim over/under/around you is a pretty surreal experience to say the least! Photo Credits: sergemelki, sfreni, chapter3, jehervey. Why go to the ABC’s when there are so many far better Caribbean Islands to visit? They are definitely third class. As to getting around Aruba, the bus services are excellent and about the only cheap thing on the island.